A competition under IndiaSkills West 2018 involving 250+ competitors in 24 trades from Maharashtra, Gujarat, Madhya Pradesh, Himachal Pradesh, Haryana and Rajasthan was organized jointly by Ministry of Skill Development and Entrepreneurship, Government of India; National Skills Development Corporation (NSDC), New Delhi; and Skill India New Delhi from 24th to 26th May, 2018 with an objective to showcase the highest standards of skills in India and motivate youth to consider vocational education as a mainstream career option. This initiative will help NSDC identify the best talent who could represent India at the WorldSkills International Competition called “the Olympiad for skills competition scheduled to be held at Kazan in Russia in 2019. As part of “Kaushal Bharat Kushal Bharat”, Regional Competition for Architectural Stone Masonry Skill was held on 25th and 26th May, 2018 at Jaipur Exhibition & Convention Centre in Jaipur. A separate block outside hall with proper infrastructure had been arranged for conducting the competition. All expenses including travel, boarding and lodging of the participants were borne by National Skills Development Council. Stone Technology Centre (Training Division), Jaipur, was a supporting partner of this regional level competition. The whole document from concept to completion for this Regional Competition for Architectural Stone Masonry Skill was prepared by Mr. K Vikram Rastogi, International Consultant on Dimension Stones, Stone Technology Centre, Jaipur. 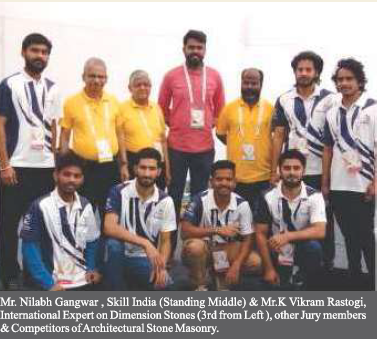 This was the first regional competition of Architectural Stone Masonry, organized by National Skills Development Corporation, New Delhi, under SkillsIndia. Seven candidates–two from Chandigarh, two from Maharastra and three under WILD card from Rajasthan, participated in the competition. All the competitors were born after 1.1. 1997. The aspirants were required to make special stone artefacts with a finish size of 860 mm (length) x 280 mm (width) x 285 mm (height). The profile given included making of concave, convex and round shapes. Template on board prepared from CNC machine was given to the competitors. One hour was given in the beginning to study the drawings and ask questions; 12 hours spread over 2 days (25th and 26th May, 2018) were given for making artefacts with half an hour at the end for cleaning the artefacts. Each participant in their protective gear (with goggles and gloves) used their own tools for making artefacts. The whole competition was supervised and monitored by a three member jury comprising of Mr. K. Vikram Rastogi, an International Consultant and Trainer, Jaipur; Mr. Vishnu Kumar, New Delhi and Mr.M.Manmadha Rao, Chandigarh. Jury evaluated the work done by all the seven competitors and declared Mr. Dahim Yaseen Bhat and Mr. Kuldeep of Government College of Arts, Chandigarh, as winner and runner respectively. The winner and runner were given cash awards of Rs. 21,000/- and Rs. 11,000/- respectively. Col. Ravi Kharbanda, Technical Consultant, World Skill India, NSDC coordinated all activities since inception for this skill. Mr. Nilabh Gangwar of Construction Skill Development Council of India had been a great help in coordinating various activities relating to selection of participants under WILD Card, organizing logistic support for the stay of participants and other related activities. Mr. K. Venugopalan, Director-NTTF, provided necessary guidance for marking system to the jury members. Mr. Ranjan Choudhury, Senior Head, WorldSkills India, organised proper working arrangements outside the hall, assisted the participants and jury members for successfully conducting the competition. Mr. J.P. Meena, Regional Director, Ministry of Skill Development and Entrepreneurship, Regional Directorate of Apprenticeship Training (R.D.A.T), Faridabad also assisted the jury members for satisfactorily conducting the competition. Marble and sandstone are available only in Rajasthan and there is a brigade of artisans working for temples, mosques, monuments and other prestigious structures. STONE TECHNOLOGY CENTRE has been working in the Stone Skill Sector since 1983. The organization has been promoting traditional stone art of India at the global level.